Ecomega private brand was born at the beginning of 1980. Saccon family’s idea to enlarge their experience in industrial tires outside the Italian markets has seen the light bringing Ecomega philosophy from national to international. Actually, the first milestone was finding a trustful partner for the production of forklift, solid and pneumatics tires. This led Saccon Gomme to build its first partnership in Sri Lanka. In the beginning of 1990 the production enlarged to skidsteer, construction, bias OTR and rubber tracks. 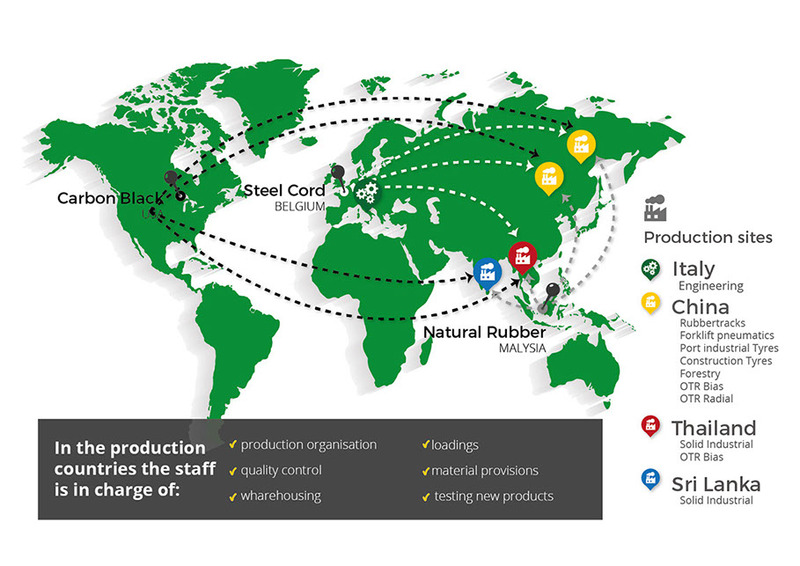 Less than ten years later a second plant was established and the production of OTR radial started in China. In 10 years China, with its fast attitude, became the first producer of Ecomega; here was moved all the bias production, increased the radial OTR production to underground tires, giant OTR tires, and forestry tires. Another milestone was the launch of one the most successful product range of Ecomega: Port Industrial line. In 2015 a second production of port industrial has been manufactured in Korea and as well a TBR tire truck line has been launched in the market. The intention of ECOMEGA for the near future is to constantly increase their range of products, both regarding size availability and practical applications; to be well-known and widespread throughout Italy and Europe by means of local distributors and agents and to increase the number of O.E. contracts with the main machine manufacturers.